Trazer M Tablet is a nutritional supplement that is mainly used to treat male infertility. It boosts energy and maanges sexual dysfunction too. It also helps in cases of erectile dysfunction. 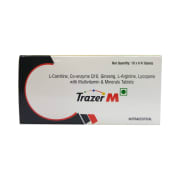 A licensed pharmacy from your nearest location will deliver Trazer M Tablet. Once the pharmacy accepts your order, the details of the pharmacy will be shared with you. Acceptance of your order is based on the validity of your prescription and the availability of this medicine.